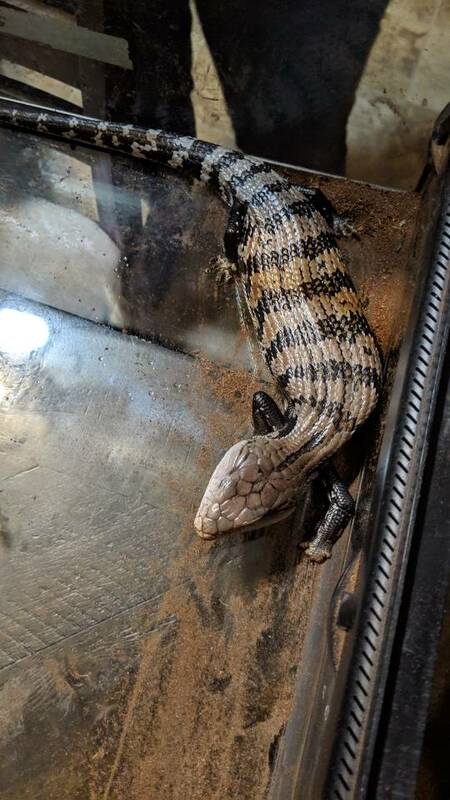 There are different subspecies of Blue Tongue Skink - I recommend you find that out first as they can differ in requirements. 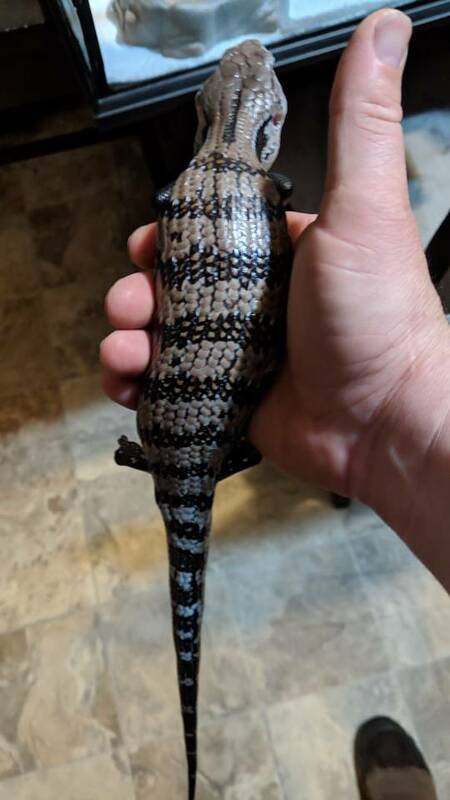 It was purchased at a big chain pet store for a kid who has since last interest so I'm sure the owner doesn't know but I will see what they know. Not even sure when we are getting it yet. But I will take pictures and see what I dig up. My wife and the owner just came up with this about an hour ago while at work so I'm fairly in the dark ATM. Most pet store ones are irian jaya or marauke or one of the other indo species. This has pics with some identifying features of the different species. My wife just messaged me and said she thinks its a "Western" not sure what that means yet. I just got home so its time to get my google on.. Checking out that link now. If it was coming from a pet store than it is probably one of the Indonesian species. I highly doubt it woukd be a Northern or Eastern BTS. Like others have said already, you will need to know exactly what type of BTS you are getting in order to research properly. Its a given you will need a good size terrarium, water bowl, food bowl, basking light, UVB light and hear source for belly heat and hides. Substrate will depend on where the BTS comes from ( Australian vs Indonesian). Food wise would be the same for any BTS, but I recommend high quality grain-free dog food(wet or raw), greens and some fruits and different types of worms (silkworms being the best). Check out "Reptile Mountain TV" on YouTube. That channel is like the BTS bible and has been a lifesaver for me. Good luck and post pictures when you get a chance. Here are some pictures. Poor one is missing more toes then it has. 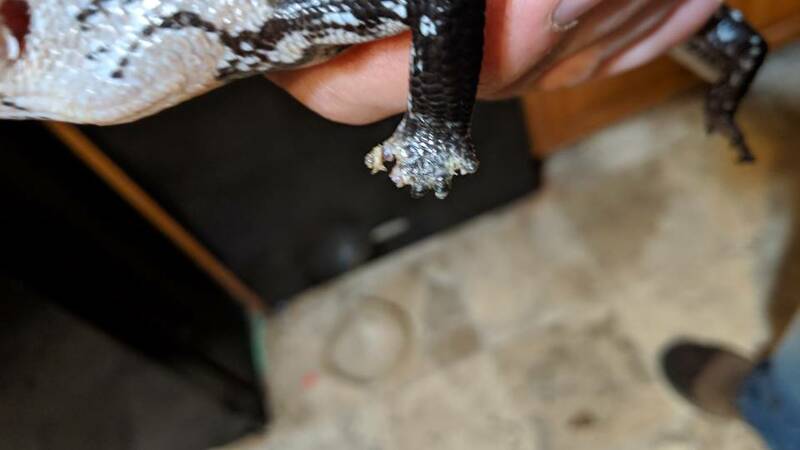 Layers of stuck shed still on toes. Spent some time soaking and rubbing with wet paper towel. Made some progress but it's gonna take a few soakings and rubs to get them all. 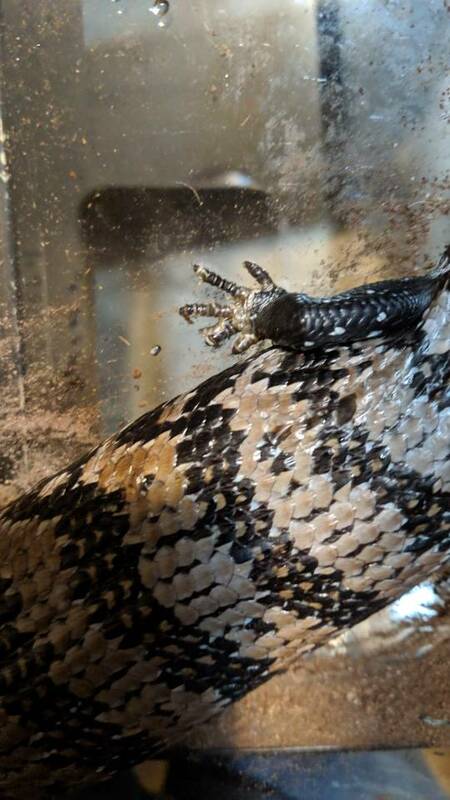 They said it was purchased from a Reptile only pet shop they had to travel 2 hours to get to but couldn't remember the name. Apparently that place breeds skinks. Only had a heat lamp with no thermostat. Will be picking one up tomorrow. Ordered a big hide, big bowl, t5 fixture and looking into what UVB bulb to get. I'm not an expert, but based on traits from the link I put up earlier and from a few other sources, I'm pretty sure this guy is a Halmahera Indonesian BTS. The black forelegs mean he is definitely not a northern or eastern of the Australian species. He definitely needs higher humidity than he had before. 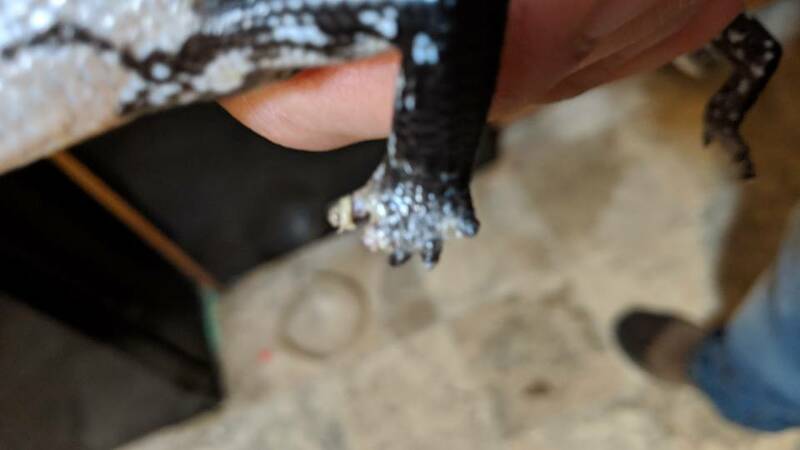 They probably assumed he was one of the Australian species or didn't know there were different ones and followed a generic care guide and had him in too low humidity the whole time they had him to cause him to lose those toes. Poor guy. I second Reptile Mountain TV as a source for skink info, I'm using his videos while I research before getting my own BTS, though I am aiming for a northern. His information is all very good. Yeah that's what I was thinking by comparing pictures. I put a hide in with some moss, misted allot and covered half the screen with a damp towel. Gonna pick up some materials to start his new forever home tomorrow. Gonna take a bit longer now that I need high humidity I need to seal it up good. But I have most stuff to improve this cage coming on Tuesday except UVB bulb and fixture will take s few extra days. I have a Merauke and I don't think that is what you have. It may be an Irian Jaya but definitely not a Northern. 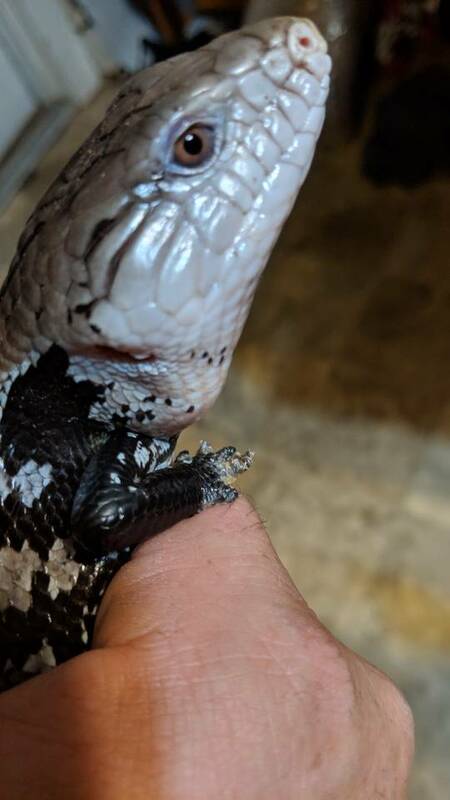 I suggest you show these pics to the keepers over at bluetongueskink forums. They have a mountain of info for each species and subspecies as well as a number of breeders who can confirm this for you. Nonetheless, T5 is too strong for blueys. A T8 is more suitable or make sure to raise the T5 fixture higher than 12" from your lizard. 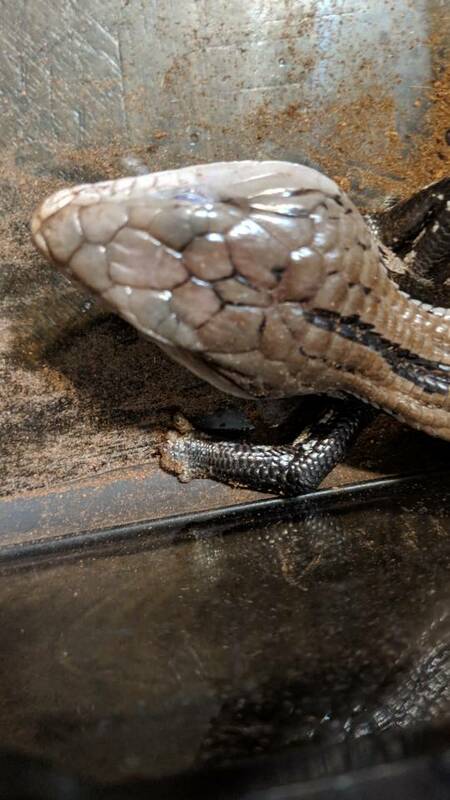 Blueys are not like beardies and while this is in debate, many don't even use UVB for their lizards. I would do it anyway but elevate your T5 or exchange for T8. Then a Reptisun 10.0 bulb for the T5 or T8 will work. Since it is not a Northern, you are working with a humidity required species. 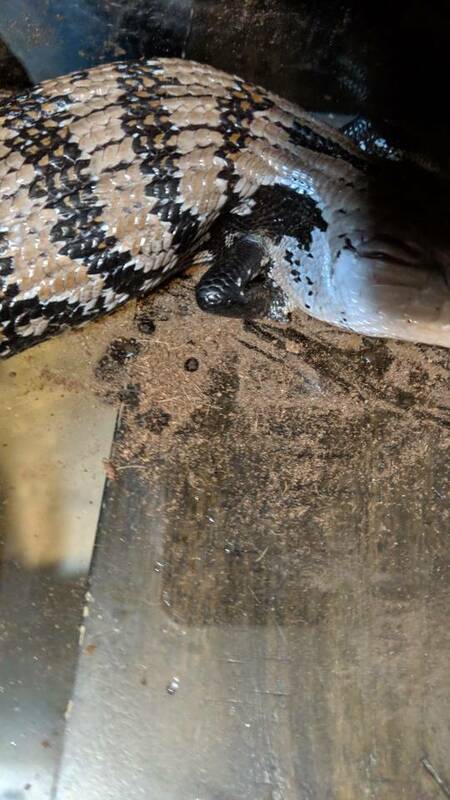 Some blueys prefer to burrow over using hides so provide about 3 inches of substrate like coco fiber and see what it does. These are creatures of habit so if it burrow, that is what it will always prefer to do. Humidity should no less than 50-60% at all times. Blueys do best in enclosures with plenty of floor space. I recommend no less than 48" long and no tubs for these guys. I don't use t-stats on my lizards. Lizards in general know how much heat they want and when to move away. It does not hurt to have it if you already ordered it. Blueys in general sleeps a lot and bask for a few hours in between if they are not exploring. 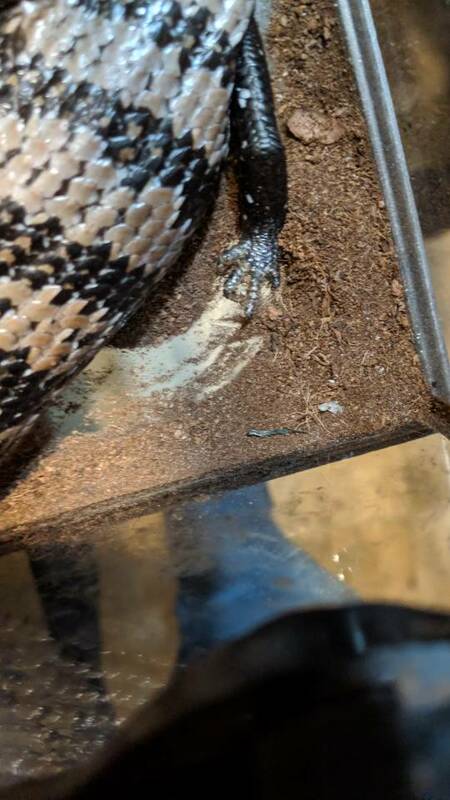 About the toes, do your best to remove the stuck shed. The humidity you are going to provide will help immensely. Make sure you have your calcium plus D3 supplements and multi vitamin. As an adult bluey, they only need to eat once a week or no more than 2x a week depending on his health.